SEASON 2 IS LIVE! Please listen, share and leave a comment! Julie Clarke is a registered psychotherapist, child and youth care practitioner and somatic experiencing™ practitioner. She works mostly in private practice in Ontario, Canada as well as virtually online offering one on one counselling and therapy as well as parent consultation and trauma work. 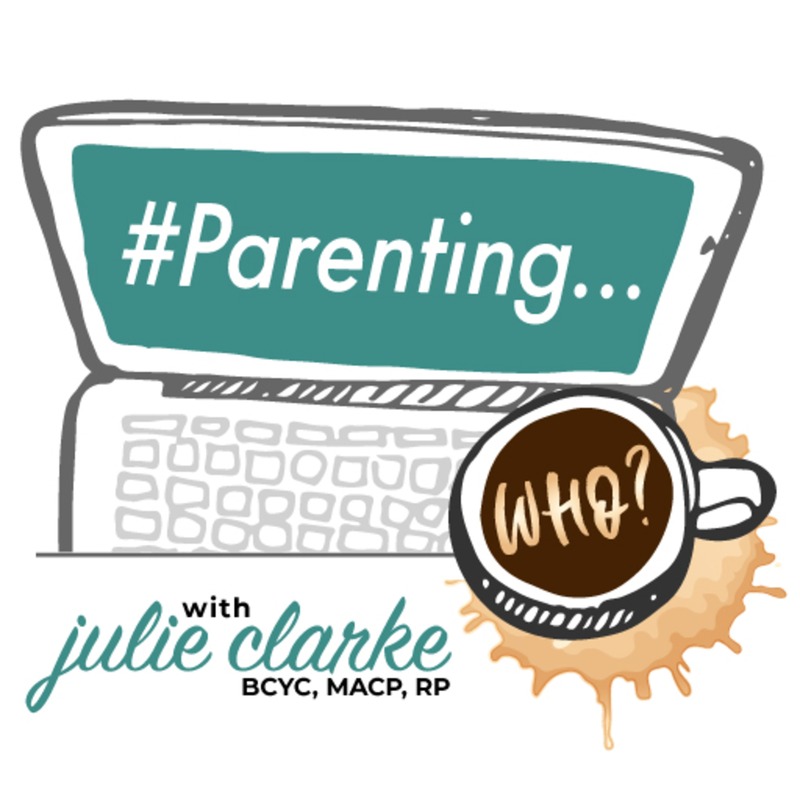 #Parenting…Who? aims to connect parents, caregivers and professionals with news and information pertaining to mental health, wellness and all that in between has to offer! And demystify therapy. Julie Clarke and Michael Spencer of Let's Purify! Nathalie Graveline Nurse Practitioner from Even Keel Health in Ontario, Canada will be working out of my physical office effective immediately. Nathalie will bring to the community an abundance of mental health and addiction experience together with her nursing expertise. Nathalie has a strong background in community mental health including helping former patients and clients with complex health and psychosocial needs. Get to know Nathalie a little bit in today’s podcast and if you are not located in and around our catchment area you may benefit from learning a little behind the scenes knowledge of working a case and what goes into it. All in the name of choosing the right mental health professional for your specific needs. Show notes http://evenkeelhealth.ca/ What is a Nurse Practitioner? https://npao.org/about-npao/what-is-a-np/? What Is This Self Care Stuff Anyways?! Unpacking Eating Disorders – Parents, What Can You Do? Evelyn is a Registered Social Worker with a Master in Social Work and a Master of Arts in International Development Studies. She shares how her passion for helping people turned into a job working in a men's homeless shelter. Together we discuss the importance of self in a helping relationship, working with a vulnerable population requires this! A homeless men's shelter is one place where self-loathe is ever present. Evelyn discusses how she works with helping men identify the self-hate they carry with them and how aligning negative behaviours with personal values; personal values that may first need to be discovered. She also discusses the importance of language and how we miss the opportunity to connect with someone through making assumptions and using language that has different meanings for both people. Discussing the impact of family of origin and why understanding, not blaming, family of origin plays a role towards recovery. What I have realized is the interviews and connections with my guests are so rich with information that we can not possibly do just one episode. Rick is no exception! Rick is a fellow colleague and Child and Youth Care Practitioner. He has over 40 years working as a child and youth worker and prides himself on thinking outside the box using innovation, creativity, prevention, health promotion, advocacy and systems change. In our time in this first episode Risk provides some insight into how he accidentally fell into the world of Restorative Practice and how this newfound knowledge opened many doors, paradigms and ways of looking at things and he hasn't turned back since. To learn more about Restorative Practice and within the context of parenting your child I guarantee you won't look back. Restorative Practice is an extremely powerful practice that can change lives, build and connect communities and dare I say truly make a difference in a world that is open and welcomes this practice. This is episode two of a series with my colleague Sarah Terwilligar, we discuss aspects of our new virtual eating disorder caregiver coaching group program. In this episode Sarah is sharing the spectrum/continuum of disordered eating where it starts and how it progresses. There is no one size fits all presentation with an eating disorder, it looks differently for everyone. Eating disorder sub-types are introduced and explained and how thinking ‘this is just a phase’ is unhealthy and why. We spoke about how one does not need to have a formal diagnosis and how a negative body image could exist without disordered eating. Asking, are these issues disrupting your life? Are you pre-occupied with your size and shape? This is two of a series of episodes on the topic of eating disorders and disordered eating, stay tuned for more! In this episode I dedicate the full episode to reviewing a wonderful, easy read document – one where you don’t have to be a clinician or therapist to understand! The title is “Developmental Trauma Close Up”. This article was writer by Dr Shoshanah Lyons, Dr Kathryn Whyte, Ruth Stephens and Helen Townsend. The authors state that above all this is an article of hope. I wanted to share that hope to you, the listeners that may be struggling either as a parent or a caregiver of a child or youth or as an adult who finds themselves struggling with day-to-day life and how, when viewed in the context of trauma-informed care your perspective may change. Please note, any and all information provided by this article should not be used as a substitute to seeking professional guidance that may be relevant to your own personal situation. This podcast is not intended to be a substitute for mental health therapy. See related video.